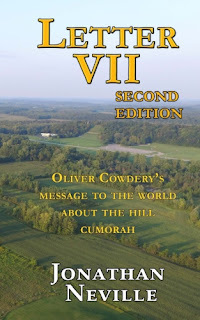 Letter VII's observations about Cumorah reflected teachings that were known before the translation of the Book of Mormon was even finished, as we know from David Whitmer's account of the trip from Harmony to Fayette. Nevertheless, some scholars claim that the association of the "New York hill" with ancient Cumorah was a later invention. They say it was a false tradition started by unknown persons, and that Joseph Smith passively adopted this false tradition. One of the Histories included in the Joseph Smith Papers was written by John Corrill. Titled A Brief History of the Church of Christ of Latter Day Saints, 1839, Corrill relates his experience with the missionaries in Ohio in 1830. "Sometime in the fall of 1830, Oliver Cowdery, Parley P. Pratt, Peter Whitmer [Jr.] and Tiba [Ziba] Peterson, came through the county of Ashtabula, Ohio, where I then resided, on their way westward. They professed to be special messengers of the Living God, sent to preach the Gospel in its purity, as it was anciently preached by the Apostles. They had with them a new revelation, which they said had been translated from certain golden plates that had been deposited in a hill, (anciently called Camorah,) in the township of Manchester, Ontario county, New York. They were deposited about 1400 years since by one Moroni, under the direction of Heaven, with a promise that in the Lord’s own due time, they should be brought forth, for the special benefit of the remnant of his people, the house of Israel, through Joseph, of Egypt, as well as for the salvation of the Gentiles upon this continent. This soon became the topic of conversation in that section of country, and excited the curiosity of the people..."
If you remember from Letter VII, Oliver pointed out that Camorah was an incorrect spelling. But the point here is these early missionaries, including Oliver Cowdery, were teaching that the hill in New York was "anciently called Camorah." Oliver was with David Whitmer and Joseph Smith in May/June 1829 when they met the divine messenger who was going to Cumorah with the Harmony plates. It was this messenger who identified Cumorah as a real place to which he was traveling in New York. Later, of course, Oliver, Joseph and others visited Mormon's depository of records in the same hill, which Mormon labeled Cumorah in Mormon 6:6.